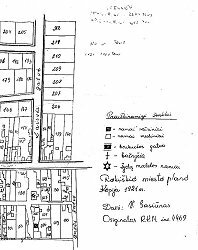 A Rokiskis street plan and accompanying list of property owners and renters for 1921 was obtained by Phil Shapiro while on a visit to Rokiskis in 1997. Each property was assigned a lot number apparently for tax purposes. The original documents are housed in the Tizenhof Museum of Rokiskis: Rokiskio Krasto Muziejus, Tyzenhauzu al. 5, 48200 Lithuania. (Thanks to the Rokiskis Regional Museum for the use of the map). 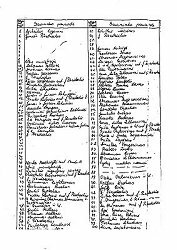 The list of names is in handwritten Lithuanian. Some of the names were too difficult to read and have been left out. 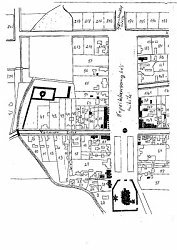 The street map shows the area surrounding the marketplace in the center of town, which is where most of the Jews of Rakishok lived. 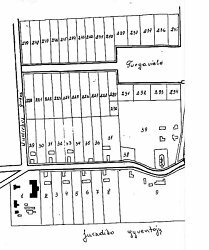 Count Jan Pshezdetsky owned one third of the lots. Count Jan Pshezdetsky is described in the Rakishok Yizkor book as a Polish lord who "owned all of Rokiskis" including the famous church which stood across from the marketplace. Persons who were renting from Count Pshezdetsky are indicated with (r). I have not included unoccupied lots owned by the count. Until the First World War, Rakishok was a county capital in the Novaleksandrovsk (Zarasai) Province. During the German occupation (1915-1918) Rakishok became the provincial capital. When the Germans departed they burnt the railway station. On the 13th of December, 1918, a Soviet government was installed which lasted until June 1919. Even during the period of an independent Lithuania, Rakishok retained its urban rights as well as its status as the provincial capital and continued to flourish. Roads and alleys were paved and sidewalks were completed. The number of houses increased and in 1923 there were 29 streets with a total of 10k., 551 houses (of which 48 were built of stone). There was a power station, three flourmills, a woodcutting mill, a dairy, a factory for starch production, a metalworking factory, a hospital with 65 beds, and two pharmacies. The town boasted ten doctors. In 1918 a progymnasium was established which in 1919 became a full-fledged gymnasium (high school). *Pp. 646-653 written by Raphael Julius. Ed. Dov Levin published by Yad Vashem, Jerusalem, 1996. Translated for the Rokiskis SIG by Haim Pogrund. NOTE: These documents have been translated from hand-written Lithuanian and the letters are not always clear. Note: Slava Krukas has identified #105, Zalmanas Zalmetas, as her grandfather and #135, Besselis Zametas, as her uncle. Lots 30-37 and 162-249 were unoccupied at the time the map was drawn up. These were scanned in quarters as the original was too large to read easily in one piece. Click to see an enlargement of each. Special thanks to SIG member Ada Gamsu for having these rescanned in a better format. Click on the list to see a larger version. A new color version of this map was recently obtained by Ellen Cassedy. This was scanned in thirds. Click on each section to see an enlargement.